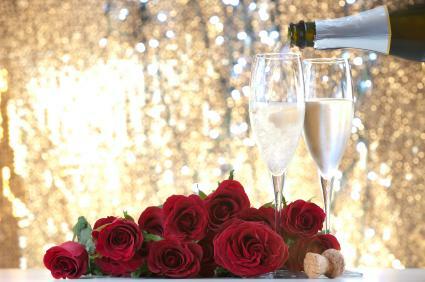 Celebrate your nuptials with a champagne brunch. A champagne brunch hosted a few weeks after a destination wedding is a great way to include those unable to travel to your wedding. 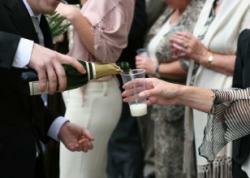 A few tips can help you plan a fun post-wedding reception that allows everyone to celebrate your nuptials. Destination weddings, once reserved for the rich and famous, are now accessible for many couples. Even if they are breaking with the tradition of wedding in a family church followed by an evening dinner and dance, they still want to celebrate with friends and family. Modern couples realize the high costs of destination wedding attendance for their guests, and often host a party back home after their return. This allows guests to share in the newlyweds' joy without bearing the cost of a wedding they cannot truly afford to attend. The guest list for a brunch reception should consist of immediate family members, bridal party attendants and guests who received a destination wedding invitation. It is not necessary to invite people who live long distances to the brunch reception, as this places an undue burden on them if they also had to travel for the wedding itself. However, if friends or family will feel slighted by not getting invited, it is perfectly acceptable to send them an invitation. Keep your own relationship dynamics, and budget, in mind when making up the guest list. Frequently, couples or their parents host a post-wedding brunch in their own home or backyard. This makes preparation easy, as everything is at your fingertips. Typically, brunches are semi-formal to informal. The invitation design will help convey this, as will the wording. Look for a design that reflects your destination, or find one with a simple elegant flourish. 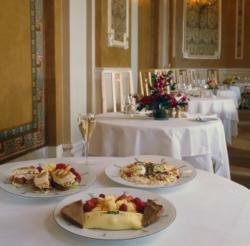 A champagne brunch is typically a sophisticated affair, but not as formal as a black-tie reception. The invitation to the brunch should include the original ceremony date, as well as the other important information for the celebration. on the island of Oahu in a beautiful beach ceremony. on Saturday, August 1, at ten o'clock in the morning. If the bride and groom are not hosting the reception, it is perfectly acceptable to name their parents or other relatives who are hosting the reception in the invitation. which took place in Venice, Italy on September 21, 2010.
in the Renaissance Hotel's Banquet Hall. Couples who decided to elope may also want to host a champagne brunch that has a short ceremony before the brunch begins. This way, family and friends can witness a renewal of their vows. in a Las Vegas elopement on February 14, 2010.
on February 28, 2010 at 10 o'clock in the morning. Once the guest list, location and invitations have been chosen, it is time to plan the rest of the champagne wedding brunch details. Unlike formal evening receptions, the details are relatively simple to pull together. Plan a delicious brunch menu. Remember to include plenty of delicious drinks. Of course, champagne is a must. Mimosas and Bloody Marys are good alcoholic drinks to include. Coffee, punch, apple juice and milk are also great additions to the drink menu. Brunches are often low key, even if they are elegant. A tuxedo and princess style wedding dress are not appropriate for a brunch several weeks after the destination wedding. Grooms can wear navy or gray suits, while brides can don a simple white informal wedding dress or other special occasion dress. If you planned a wedding at an exotic locale, it is a great idea to include the location in your décor. For example, if you married on the beach, plan centerpieces with seashells. Set up a slideshow or display with photos from your destination wedding ceremony. Place small favors at each place setting on the tables to thank your guests for their attendance. A champagne wedding brunch that follows a destination wedding is a beautiful way to share your love with everyone who couldn't attend the ceremony. This is an elegant alternative to hosting a post-wedding evening reception that guests are sure to fondly remember.